I took this to my tennis party a couple weeks ago and everyone loved it! 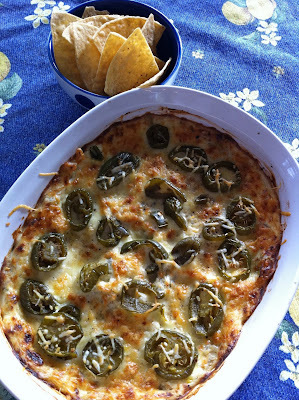 So, I made it again for my husband, Corey, but this time I used hot jalapenos. This dip is soooo good! Mix the first 5 ingredients in a bowl with 1 cup of the Parmesan cheese. Turn into a baking dish. Garnish the top with the sliced jalapenos and the remaining Parmesan cheese. Bake at 350 for 30 minutes, then broil for 5 minutes until brown and bubbly. Serve with your choice of tortilla chips, sliced baguette, crackers, or veggies. Enjoy!